I have a little adventure for you. I found something on Google Earth and knowing your sense of curiosity I thought you may be able to find out some info on it. You interested? Go to 18 deg 24 min 20 sec .16 N and 88 deg 23 min 13 sec .14 W and find out info on what you see. Mischelle and I will be down on Dec 1 - Dec 9. We hope to hook up with you for lunch or dinner if possible. Well, that kind of intrigued me. I first thought of a UFO or maybe some unknown Mayan temple or something even stranger along those lines. Wow! Who'd a'thunk it here in Corozal. I wonder if it's what it looks like? I've never heard anyone say anything about this at all. We'll be in Belmopan today, but tomorrow we'll cruise up by there and see what we can find out. Unfortunately, I wouldn't be able to get onto this case as quickly as I would have liked. Dianna and I had appointments at the US Embassy in Belmopan to have pages added to our passports. So that was effectively going to kill the whole day. What I did do, was to bring up Google Earth on my laptop to plug in the latitude and longitude (18° 24' 20.16" N and 88° 23' 13.14" W) from their message. 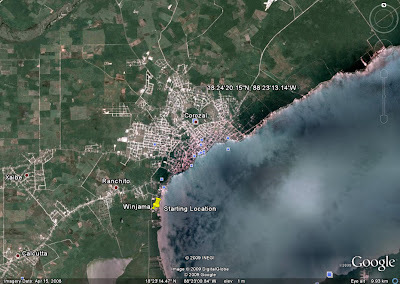 This first Google Earth image is of the greater Corozal area (as if it's so big to start with). 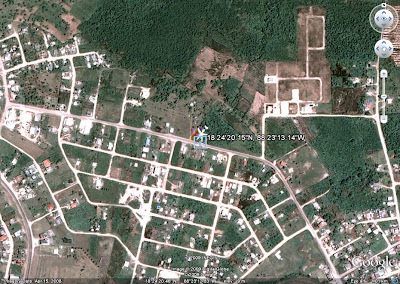 Really, though, we do tend to forget that Corozal is just a small town in the greater scheme of things. Here's the image that popped up after I keyed in the Lat and Long they had given me. Holy Cow! A Downed Drug Runner? An Old Wreck? After an uneventful day over to Belmopan and back (that's a story in itself - not the trip, the embassy), and getting a good night's sleep, I hot-footed over to Doug's in the morning and asked if he'd like to go with me to see what was there... if it really was a plane or what. We mounted up on my trusty Isuzu and headed off for the north end of Corozal and this mystery plane. Well, Doug and I went up there this morning to see if we could find the plane. We couldn't. But, the mystery isn't over. The area the plane would be in if we could see it, roughly a block-sized area, is some of the densest overgrown bush I have ever seen. It would definitely take a couple of guys with machetes a while to chop their way in there. We drove all around it several times, well almost around it, as much as we could, trying to peer in through the bush. Just no way. It would require chopping to get in there. Even though it looks like the nose would be right near the road, you just can't see in. I've been thinking that when we first moved down here, someone told me about a plane that was forced down (I assume hauling drugs) in the 70's. I wonder if there's a connection. Oh well. The mystery continues. Maybe we'll keep checking it out and see if we can figure out what's what. Good eyes spotting that on Google Earth, BTW. It was definitely some dense, dense bush right there, which seemed kind of mysterious in its own right. I was intrigued. Doug and I talked on the way back to the house by way of D's Supermarket for some chips and other healthy food about how we might find out what was in that bush patch. We even talked about convincing Lynn to fly over it so I could take some closer photos that what the satellite afforded. Could it possibly be a plane flying overhead? Could someone disassemble it and reassemble it elsewhere (aka, Radar from MASH sending home a Jeep)? Maybe it took off in the night so nobody could see them, between when the picture was taken and now. Or maybe it's the Google people fooling with us. I'll bet your readers could help. A few of them seem to be in Belize. If not, I'm sure a good writer could think up some kind of adventure story that would incorporate our wayward airplane. Hmmm, that could be interesting, writing up a mystery. How it got there, where it went, what happened to it and the crew, etc., etc. But then, I got to thinking about Perry's first sentence - "Could it possibly be a plane flying overhead? Well, back to Google Earth I went. Y'know what? I'll bet you're right. It is a jet heading south. Blow the picture up slightly and you can detect heat waves off the aft end, and I'll bet the orangey looking thing immediately to its left is actually its shadow - weird color but I'll bet a shadow. Sure would save thrashing through the bush with machetes and all the snakes and stuff. That's it. 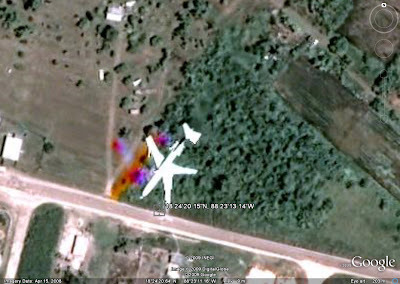 The satellite caught a jet flying over Corozal at the very instant it snapped the photo. It probably looks in focus because, I would imagine, the satellite camera must have a pretty good-sized depth of field. Pretty amazing and a bit of fun while it lasted anyway. Thanks Perry and Mischelle. It was a fun adventure, and it really was elementary, Watson. I was hoping there would be a plane there so I could read a fun story on its origins. Maybe you should go for another look see.